Forget the boring history lessons of your youth! Time Zone brings alive the great historical events of our country, making them accessible and entertaining to all age groups – and you don’t need to know anything about history to play it! 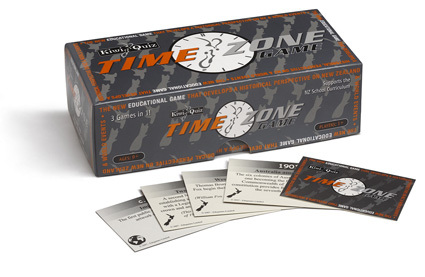 Combining three different games in one, Time Zone can be enjoyed solo or in groups, from the classroom to the campfire. Enjoy some fun family times together for ages 9 to 109! If you would like to order Time Zone direct, please click on the icon. For bulk pricing options, please contact us with details of your request.